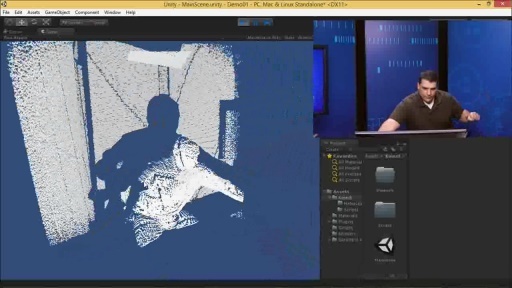 Kinect provides new ways to interact with applications using gesture or voice. Experts explain how they created the hand cursor, PHIZ, and user interactions, and they go through sample code to show how this can be leveraged in your applications. Also, learn about how to speech-enable your application. - What about Dictation ? - What about overlap with Cortana, Skype (live translation), ... ? - What code say "this word is an engagement" ? in XML ? only a good match ? How long is the timeout ? 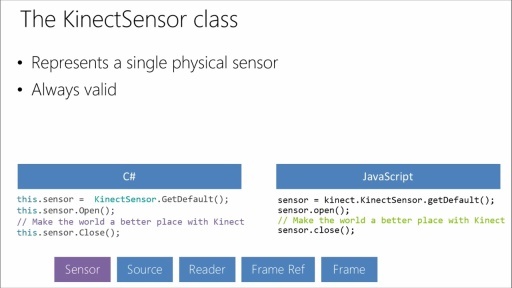 I installed the Controls Basics - XAML from the Kinect Developer Toolkit. I opened in Visual Studio Express for Windows and it asked me to convert to Windows 8.1 app. I used the conversion tool (I think under the Project menu). I then built the conversion (with no errors), but when I try to run it I get an exception error in the App.p.i.cs file on line 24. Anyone else have this issue or give a suggestion of what to do? UPDATE. I deleted and reinstalled, redirected to 8.1 and built. No error, but the XAML window will just open for a second then close. Not bring up any of the controls or anything. I am baffled about what it doesn't like with my machine. I am going through the demo in the video and see if I can figure it out. Is it possible to program using actionscript?